Maybe Jack needs to decide for himself, when it comes to those big, important Star Wars questions? I really need to edit these strips down! This one took ages. I briefly flirted with 6 panels – and even 2! – but now I’m back up to 9 again. Sometimes I just can’t get everything that’s in my head into 6 panels. And I was loathe to split this one over 2 whole weeks. That’d be a drag for you readers! Ideally, I’d like to do two x 4 – 6 panel strips per week; say, on Mondays and Fridays. Well, we’ll see. If I can make a real go of this self-publishing business, I might even get up to Mon, Wed &Fri! I’d love that. Maybe it was just because I was ill this week, or maybe it was because the extra time I had made the work fill the time available – but I re-wrote and re-wrote this strip. I need to know when to stop! The good thing about building up a ‘buffer’ of lots of strips in advance of publication – so you can stay ahead – is that you can refine ideas, artwork and scripts. But I also now see, how that could increase production time! 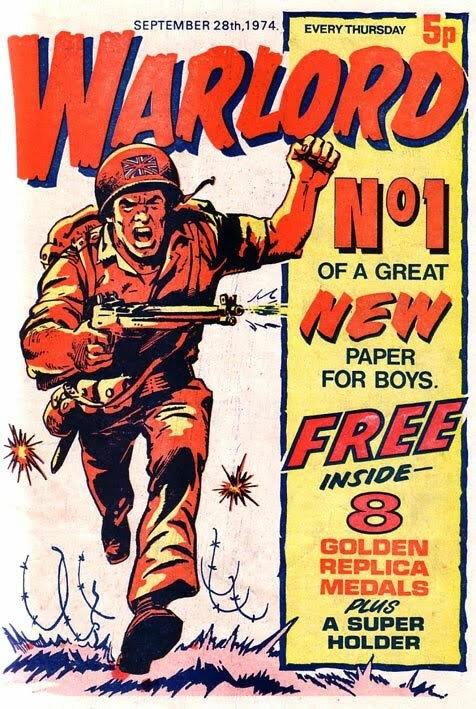 Did any of you love your 1970s comics? Warlord, by DC Thompson was the first one that I got massively into. The one I showed here is actually Issue#1. I wonder now how I managed to read it – because I was only 6 and a bit years old! How I loved the replica medals they gave away with the first issues. The free gifts back then were brilliant actually. Model planes, heliographs for signaling morse code with… What were your favourite comics? I wrote previously about « the Warlord Secret Agent Club and « Warlord/Comic controversy. Thanks to Niall Barr for advising me on the book which Noel is carefully hiding inside his comic. ‘Six Armies in Normandy‘. And to Peter Briggs for mentioning that the deflated football, which Jack kicks, looks like a Tortoise! John, now that you’re being diligent about publishing every Friday, I find I look forward to these strips like I used to look forward to my comics as a boy. Some lovely art here – especially the facial expressions, and Noel’s tugging on the liquorice bootlace. It really repaid a second reading. You’re right about the period settings in Cradle To Grave. Superbly done. I occasionally wished they’d slow the pace down a bit so we could take in the art direction! As for favourite comics of the 1970s, mine had been Krazy Comic, which I remember being really out-loud funny and rebellious, far from the just mildly amusing comics I was used to. And then there was Bullet, with its action hero Fireball, who looked remarkably like Biggs Darklighter. There was a lot of playground rivalry between fans of the DC Thomson stablemates Bullet and Warlord, and I’m sure I remember Bullet containing a plea for readers not to get into fights with Warlord-lovers. (Apologies if I’ve shared that here before.) All this, of course, was eclipsed when Star Wars came along. Glad to hear you’re looking forward to the Friday instalments Darren.